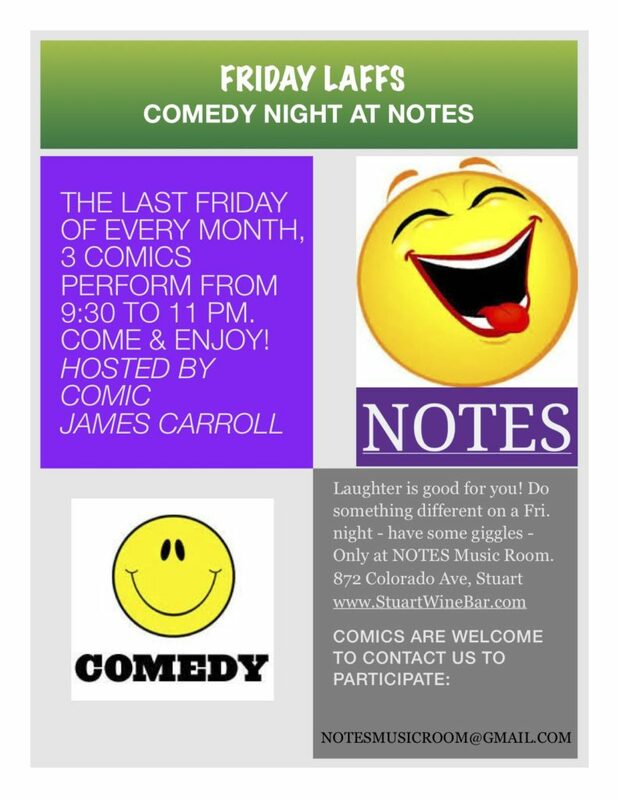 Come be amused and entertained by 3 local comedians, the Last Friday of every month! 9:15 PM to 11 PM. This is the only Comedy Night in Stuart, FL – the comics deeply appreciate your attendance and support! Notes Music Room offers beers, wines, non alcoholic beverages, rum punch, screwdrivers, bloody mary’s, green apple martinis, Cuban coffees, pastries and tamales! Truly something for everyone! Free parking in rear of building. Please note there is a minimal $1.50 entertainment fee charged during performances. Visiting Notes is discovering a true gem in Martin County! Last Friday of every month! 9:15 PM to 11 PM.